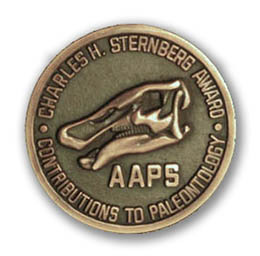 The Charles H. Sternberg Medal was created by the Association of Applied Paleontological Sciences (AAPS) in January of 2003 to honor very special friends and members of our organization who have given a large portion of their life to paleontology. This is the highest honor that our organization can bestow on any person, whether they are an AAPS member or not. This award is named after C. H. Sternberg, one of the best known, one of the first, and one of the most prolific commercial paleontologists in North America. 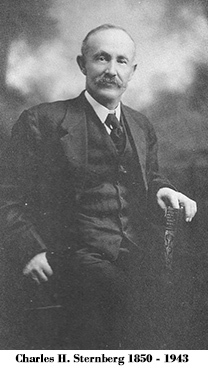 Charles and his sons (Charlie, George, and Levi) excavated and sold many magnificent fossil specimens to most of the paleontological museums in the world (from the late 1800's through the mid 1900's). They initially collected reptiles and fish from the Kansas Chalk, and then branched out, collecting dinosaurs, reptiles, and mammals extensively throughout the American West, Western Canada, and the Argentinean Region of Patagonia. The Sternberg's helped build, through their fossil sales, the collections of: The Royal Ontario Museum, The National Museum of Natural Sciences in Ottawa, The Canadian Museum of Nature (formerly The Canadian National Museum), The American Museum of Natural History, The Senckenberg Museum, and dozens of other museums worldwide. Museums throughout Europe and North America benefited from the skill and luck of the Sternberg family's collecting. Charles and his sons also located many specimens for what became The Royal Tyrrell Museum of Paleontology in Drumheller, Alberta. The Sternberg Museum in Fort Hayes was founded by Charles' son George Sternberg. The Charles H. Sternberg Medal is a fitting tribute to the determination and dedication of this First Family of Fossils and a tribute to those we honor with it. The Charles H. Sternberg Medal is awarded for outstanding lifetime achievement in the field of paleontology and/or for fostering cooperation, communication, and understanding between professional, amateur, and academic paleontologists. It is a wonderful opportunity for the AAPS to present this awards to friends and members who made great contributions in paleontology while they are still with us. The Sternberg Medal recipient is also given a lifetime honorary membership in the AAPS. While the concept of the award was the brain child of AAPS Board members. The layout and design was completed by Victor E. Porter, a jeweler by trade, and a lifelong friend of paleontology. Victor struck all the medals, engraved the recipient's name and date of presentation and completed each with a red, white and blue ribbon and presentation box. Victor struck all of the medals until his death in 2016. Thanks to a very generous donation by AAPS Member Nelson C. Maniscalco, professor of art at Cedar Crest Collage in Pennsylvania and the assistance of Victor Porter's wife Dee Ann, an original unfinished Sternberg Medal was discovered in Victor's workshop and sent to Nelson, who finished the medal and made a new mold. Nelson supplied AAPS with a supply of the bronze medals that can be engraved and presented in the future. The Charles H. Sternberg Medal is a cast bronze medallion. Engraved on the front is the image of an Edmontosaurus skull [the Sternbergs collected many], and the words Charles H. Sternberg Award Contributions To Paleontology and AAPS. Inscribed on the back side is the name of honoree and the year presented. The membership of AAPS is asked to place names of future nominees for the Charles H. Sternberg Medal before the board of directors for consideration. The medal does not need to be awarded every year, but it should be presented to members and non-members who have made a vast difference in helping form a bond between commercial and academic, or for those individuals who have contributed much to science throughout their career in business.